A future student at Grace College has already built up an impressive resume. The Herald-Palladium in St. Joseph, Mich., shared the story of Caleigh Dahn. A portion of it appears below. Click here for the complete article. Caleigh Dahn is a 15-year-old aspiring zoologist who attends Southwestern Michigan College with plans to transfer to Grace College. COLOMA — Caleigh Dahn is a Girl Scout, an aspiring zoologist, and a college student. And she’s 15 years old. Home-schooled by her parents, Ed and Maria Dahn, the Coloma teen started attending Southwestern Michigan College when she was 14. In July, she spent two weeks in Costa Rica and Panama, learning about coastal ecology and helping with sea turtle conservation. 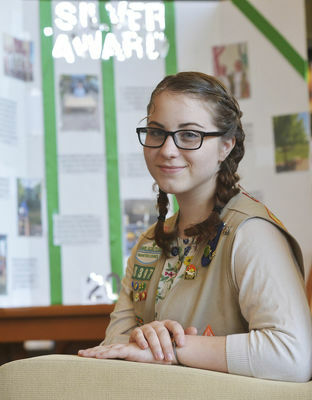 A member of Girl Scout Troop 8397 of Michigan and Wisconsin, she earned her Silver Award by placing a “buddy bench” at Grace Christian School in Watervliet, and is working on her Gold Award, equivalent to Boy Scouting’s Eagle Scout, the highest possible. She plans to complete her associate degree in general science by age 17, transfer to Grace College in Winona Lake, Ind., for her bachelor’s degree in biology, and aspires to earn her master’s degree in zoology by age 22. She is the sister of current Grace student Raphael Rauner. He supports and helps her whenever he can. He is also one of the reasons she works so hard.